If you take a hot shower or bath, use hot water to clean dishes, or wash white laundry in hot water, a water heater is essential to your household needs. When choosing a new water heater, your options involve style--conventional or on-demand--and energy efficiency. Most houses utilize a whole house water heating system, which means that one large heating unit is installed to make hot water for the entire house. Conversely, a point of use hot water system relies on several smaller water heaters, strategically installed near a home's appliances and sinks. Because plumbing pipes connect the water heater to your appliances and faucets throughout the house, you should consult a licensed plumber to determine which system is best for your home. Then, decide which style of water heater is likely to be the most energy-efficient, based on your location's most economical energy source. A conventional water heater stores hot water in a tank, and then dispenses it when a faucet in your home is turned on. 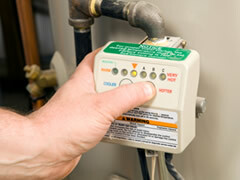 Conventional water heaters can be powered by electricity, natural gas, propane or solar. Many conventional models are priced between $300 and $600. A tank-less water heater, also called an on-demand water heater, has no holding tank. Instead, it instantly heats the water as it is needed. You might pay between $800 and $1,200 for an on-demand water heater. While both conventional and tank-less models are widely used, the type of fuel available in your area may best determine which type of water heater is right for your house. For example, it can be very expensive to operate an electric, on-demand water heater in an area with high electric rates, in which case a natural gas-fired model is probably the more energy-efficient choice. In some homes, a hot water heater can account for almost a third of the household's energy consumption, which is why it makes sense to upgrade an older heater to a newer energy-efficient model. Water heater manufacturers are required to print an EF (Energy Factor) rating on all of their units, and the higher an EF rating, the more energy-efficient the heater. When comparing the energy efficiency of different models, you should also note the unit's recovery speed, which measures how long it takes to heat a full tank of water. Some tank-less water heaters, on the other hand, are capable of producing a continuous supply of hot water. GE, Rheem, Kenmore and Bosch manufacture some of the most popular models of water heaters, which are readily available at home improvement warehouses and from the local plumbers who install and service them. If you need help finding a plumber, you can get started by filling out the form on this page.